I spent a few days in the White Mountains last week on a photo shoot, and as always, was awed by the amazing display – even though the color is a little bit spotty in places. We’ve had an inordinate amount of rain and the first hard freeze was quite late – both of which have impacted the “show.” In some locations, the trees are still green (and may not turn at all before the leaves drop). Still, the color was excellent in Pinkham Notch, Bretton Woods, Twin Mountain and Bethlehem. It also began to develop quite nicely along the Kancamagus Highway at the end of last week. Below is the image I’m most pleased with from this last shoot. 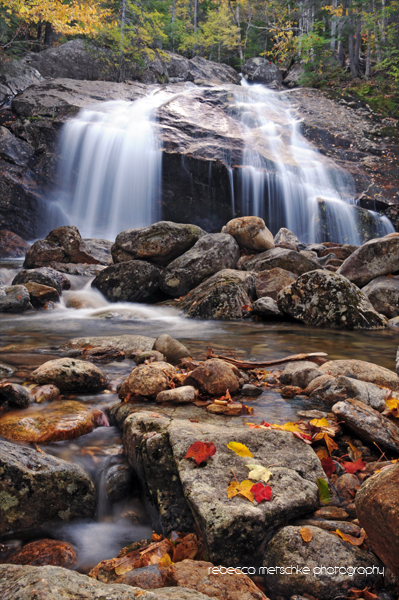 Thompson Falls in Pinkham Notch is a little bit of an out-of-the-way place, which makes it even more attractive. Though busloads of “leaf peepers” and waves of cars from southern New England were descending on the region, I never saw another person as I hiked to and worked at this location. Heaven!